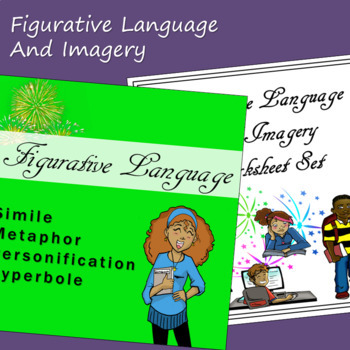 This resource includes both a Figurative Language slide presentation and a set of Figurative Language and Imagery worksheets. The PowerPoint has four sections - similes, metaphors, personification, and hyperbole. 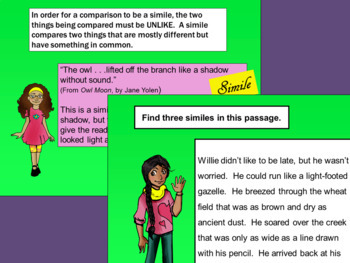 The slides include examples from a number of different types of literature, and various types of brief practice activities are also included for each of the four kinds of figurative language. 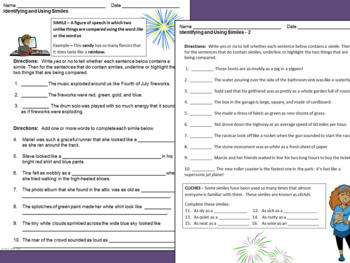 Four fill-in-the-blanks student notebook pages, one for each type of figurative language, are also included, along with completed copies of the notebook pages for students who might need those. The notebook pages can be printed out in advance for students to complete as they view the slides. 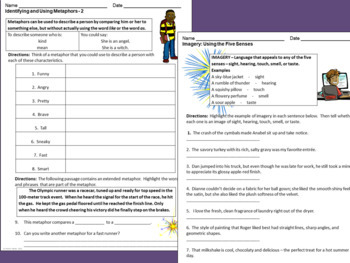 The Figurative Language and Imagery Worksheet Set consists of 12 worksheets. The topics include: similes, metaphors, personification, hyperbole, imagery that uses the five senses, and writing with figurative language and imagery. For additional practice, also see the Figurative Language and Imagery Task Cards.